In a glass mug, mix the Agave syrup into the warm coffee (if the coffee is warm, the syrup with distribute evenly, making it possible to use less sweetener). 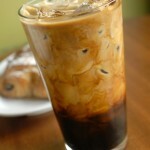 Fill a 16 oz glass with approximately 8 ounces of ice, and pour the sweetened coffee into the glass. Add the milk and vanilla extract then stir. Could you substitute the Agave syrup for stevia? I’ve used agave in cold liquid and it’s always mixed evenly. And I cringe at the idea of pouring warm coffee over ice. I’d rather have cold brewed coffee so I don’t have to worry about watering it down with ice. Otherwise it sounds like a good solution to the coffee shop options. Any “healthy” sweetener will work in my Beach Body Vanilla Latte. Sometimes I use Xylitol. But remember that any sweetener that ends in “ol” is a sugar alcohol. Some people may get a loose stool from sugar alcohol. I most often use agave. But a little goes a long way since it is so sweet. Enjoy! Do you think fat free lactose free milk will work? That should work just find. Sometimes I use Coconut Milk too. Adds a little extra flavor-yum! 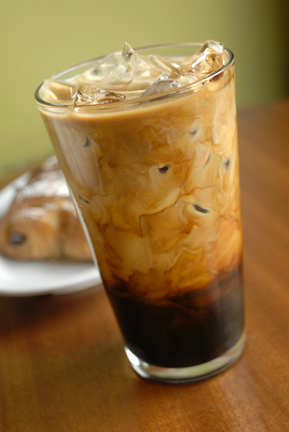 Use coffee to make ice cubes, then they will not water your coffee drinks down.